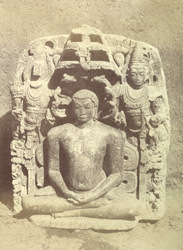 Photograph of a Digambara Jain image of the Tirthankara Parshavanatha from Annigeri, taken by Thomas Biggs in 1855. Annigeri used to be an important centre under the Chalukya rulers in the 11th - 12th centuries. This view shows a sculpture from that period representing the Tirthankara Parshvanatha with attendants chauri-bearers or carrying fly-whisks.